Glycolysis is an anaerobic metabolic pathway, found in the cytosol of all cells, which forms adenosine triphosphate ( ATP ) by degrading glucose . It also serves as a source of precursors for other pathways, and as a recipient of products of various pathways for use as metabolic fuels. Its universal and central role in metabolism suggests that glycolysis evolved early in the history of life. The process of glycolysis. In glycolysis, the six-carbon glucose (shown without its hydrogens or oxygens) is first destabilized by the addition of ATP, and then split. Further transformations create NADH and new ATP, leaving a pair of three-carbon pyruvates. the pyruvic acid can be further oxidized by the Krebs cycle to yield additional ATP. The ten steps of glycolysis can be divided into two stages. The first five steps, the preparatory, or priming, phase of glycolysis, prepare the glucose by phosphorylating it twice, using two molecules of ATP as sources of phosphate. This increases the energy content of the glucose, so the preparatory phase is also sometimes called the investment stage, reflecting the need to invest two ATP molecules before a net yield of energy can be achieved. 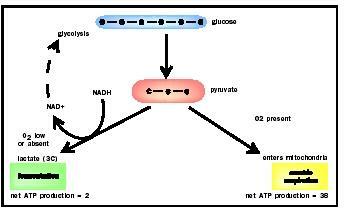 During the second five reactions, the payoff phase, the fructose-1,6-bisphosphate formed during the preparatory phase is dephosphorylated and cleaved, forming two molecules of pyruvate and four of ATP. Because two ATPs are used and four are produced during glycolysis, there is a net production of two molecules of ATP for every glucose consumed. Since glycolysis plays a central role in cellular metabolism, it has several control points. Like most pathways, it is regulated during its early steps. Hexokinase, the enzyme that catalyzes the first reaction, is inhibited by its product, glucose-6-phosphate (G-6-P). The third enzyme, phosphofructokinase (PFK), is regulated in a complex manner by several metabolites , and is also under indirect hormonal control. 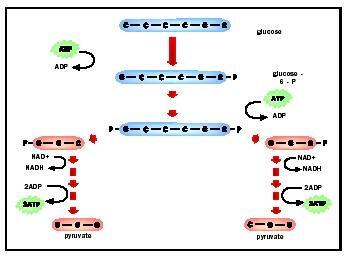 The last glycolytic enzyme, pyruvate kinase , is regulated by several metabolites, including ATP, which inhibits it. These control mechanisms have the effect of maintaining a constant supply of ATP for the cell, since production of ATP inhibits the process, and depletion of ATP activates it. In the absence of oxygen the pyruvate is converted to NAD in reactions collectively referred to as fermentations. preparatory phase of glycolysis. All such cells accomplish this by converting the pyruvate to another product, oxidizing NADH to NAD in the process. These reactions are collectively referred to as fermentations. Animals, some plants, and most bacteria produce lactic acid, whereas yeast and a few bacteria produce carbon dioxide and ethanol. Rarer fermentations produce a variety of organic molecules such as other alcohols and organic acids. Fermentations are used extensively by industry to produce these compounds cheaply, as well as to produce foods such as yogurt, bread, wine, and beer. Bodner, G. M. "Metabolism: Part I, Glycolysis." Journal of Chemical Education 63 (1986): 566–570. Sparks, S. "The Purpose of Glycolysis." Science 277 (1997): 459–460.